With the New York Giants reporting to camp next week, BigBlueInteractive.com is breaking down each of the team’s positional groups from now until July 21. Today, let’s take a look at this year’s safeties. 2013 YEAR IN REVIEW: Things truly couldn’t have started much worse for the Giants’ safety unit in 2013. In the team’s third preseason game versus the Jets, Stevie Brown injured his knee returning an interception and was lost for the year. Shades of C.C. Brown began to dance in the minds of fans… then Will Hill happened. 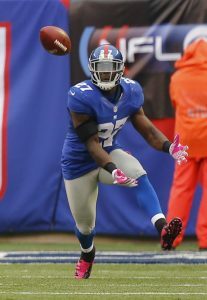 Hill returned from a four-game suspension to take over as the Giants’ starting safety opposite Antrel Rolle. Hill recorded 77 tackles, two forced fumbles, two interceptions and scored a game-winning touchdown versus the Lions. For 12 weeks, Hill flashed the play-making ability that made him one of the more coveted recruits out of high school. The safety played with reckless abandon, a never-ending motor and was constantly around the ball. As was the case versus the Redskins when Hill ripped the ball out of the hands of Pierre Garcon on fourth-and-1, preserving a Giants victory. While the 24-year-old’s season was impressive, so was that of his safety counterpart. Finally being allowed to play safety full time, Antrel Rolle put together his best season in a Giants’ uniform. The former first-round pick earned Pro-Bowl honors, finished with the team lead in tackles (98) and interceptions (6), recorded two sacks and forced fumble a fumble. Behind Hill and Rolle, Ryan Mundy was solid in Perry Fewell’s signature three-safety package. The 29-year-old was a force down in the box and recorded 77 tackles, good for fifth on the team. Rookie Cooper Taylor saw limited action, mostly on special teams. ADDITIONS/SUBTRACTIONS: Get this one out of the way early: After captivating the hearts of fans, Will Hill’s unbelievable season won’t get an encore. For the third consecutive year, Hill faced a drug-related suspension after his urine came up positive for marijuana. While the third-year player claimed it was for ‘second-hand pot,’ the six-game suspension was the last straw in a troubled career. The Giants cut ties with Hill, having warned him over and over again he was on his last strike. 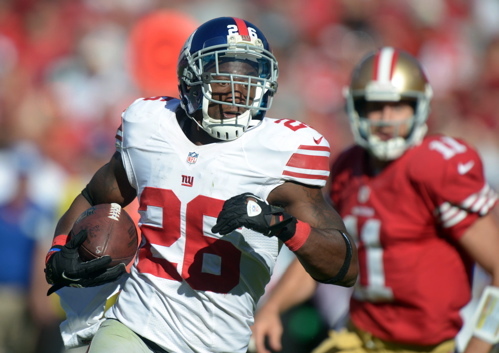 Ryan Mundy also left when the Giants’ chose not to renew his one-year contract. The team re-signed Stevie Brown, who looks to have slid back into his starting safety position. 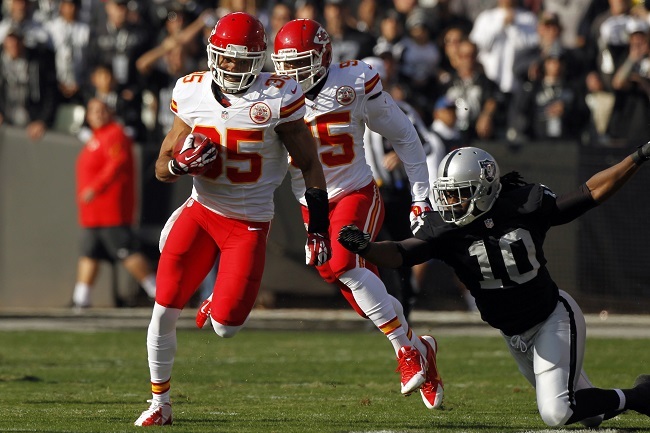 Quintin Demps was brought over from Kansas City and Nat Berhe was drafted in the fifth round. C.J. Barnett and Thomas Gordon were brought in as undrafted rookies. TRAINING CAMP STORYLINES: The health of Stevie Brown and his ability to ‘replace’ Will Hill may be the No. 1 question heading into camp. While Brown did record a league-high eight interceptions in 2012, many were a result of being in the right place at the right time and teams wanted to test the unproven Brown. Does he have the natural athletic ability that Hill has? No. Can he be serviceable? Yes. How serviceable? No one knows. Cooper Taylor’s progression and the overall talent of Nat Berhe will worth keeping an eye on. Taylor has added muscle in the offseason, per the coaches request, and may be a sleeper to see increased playing time in his second year. In college, Berhe played San Diego State’s ‘Aztec’ position, a hybrid mix of the linebacker and safety positions. If he develops, he may make an immediate impact, but will need to climb the depth chart first. ON THE BUBBLE: There really isn’t any big-name player that is in jeopardy of being cut. Right now, the Giants have seven safeties on the roster and figure to keep four or five. The odd men out? Most likely C.J. Barnett and Thomas Gordon. Cooper Taylor may be in warm water, but the odds of Jerry Reese cutting last year’s fifth-round pick are slim-to-none. FROM THE POSITIONAL COACH: David Merritt on what makes Quintin Demps a good candidate as the team’s third safety: “His speed, his ability to actually change directions and burst. Quintin has played back in the post for most of his career. One of the things that he told me when he first arrived was, ‘Coach, I want to be down near the box.’ So when he said that I said, ‘Well you know what, I’m going to give you all of the tools to hopefully help you be successful down around the box.’ His speed, his ability to change directions and burst is one of the valuable assets that he brings to the table. Connor Hughes – I’m very, very concerned with Stevie Brown heading into the 2014 season. Not necessarily for his health, but simply because I’m not convinced he’s a starting-caliber player in the NFL. What made Brown so good for the majority of the 2012 season was that he was allowed to play back in the ‘Kenny Phillips’ role. Brown would line up 15-20 yards behind the defense, wait for the deep ball and then track it down in the air. When Phillips played the position, teams stayed away from the deep pass. When Brown played it, they attacked him. The result? Eight interceptions. I agreed entirely with the Giants decision to cut Will Hill. It was time. You can’t send that message to the locker room keeping him on the team. But looking over the roster, I just don’t see a viable replacement. The revamped and retooled cornerback position is going to have to carry the load. With their paychecks, that shouldn’t be a problem. With that being said, there will be times Dominique Rodgers-Cromartie guesses wrong, it’s part of his game. Will there be a player behind him to catch his mistake? We’ll see. Eric Kennedy – Losing Will Hill was a huge blow. The defense dramatically improved in 2013 once Jon Beason and Will Hill were inserted into the starting line-up. Hill looked like a future Pro Bowl free safety. He might have been the best player on the team last season. Now he’s bagging groceries. Stupid is as stupid does. Like Connor, I have my doubts about Stevie Brown. In 2012, he definitely had a nose for the football, but he also was missing in action on some big pass plays. In addition, he doesn’t hit or play the run like a big safety. I’d accept fewer interceptions if you could guarantee fewer big coverage breakdowns and better run defense. 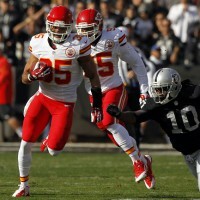 The coaches have been talking up Quintin Demps more than his reputation in Philadelphia and Kansas City should indicate. Demps thinks he is better suited closer to the line of scrimmage and he may be right. 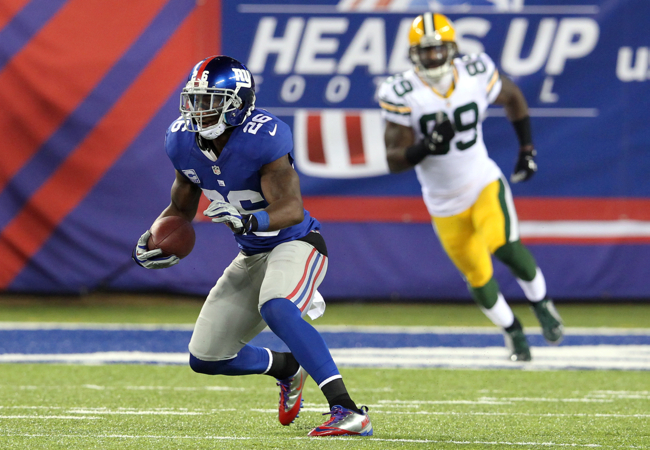 Demps has the inside track on the third safety position in the Giants three-safety package. If he stumbles, Cooper Taylor has the physical tools to steal playing time. My prediction is that 31-year old Antrel Rolle hasn’t peaked and will have an even better season in 2014. He’s the unquestioned leader of the strongest part of the defense. I expect that to motivate him, as well the fact that he’s entering the final year of his current contract. And I expect the talent at cornerback to allow him to take more chances to make plays on the football. He hasn’t returned a pick for a touchdown yet as a Giant (four times with Cardinals), but I believe he will do that twice in 2014. Connor Hughes – Antrel Rolle/Stevie Brown start. Quintin Demps third safety. Cooper Taylor and Nat Berhe reserve. C.J. Barnett, and Thomas Gordon cut. Eric Kennedy – Antrel Rolle/Stevie Brown start. Quintin Demps third safety. Cooper Taylor reserve. Nat Berhe, C.J. Barnett, and Thomas Gordon cut. My biggest problem is figuring out how the Giants get from 54 to 53. My gut says Nat Berhe makes the team, but I can’t see how the Giants can carry 11 defensive backs in addition to nine defensive linemen, six wide receivers, and five running backs/fullback. Something has to give. I’m guessing they try to sneak Berhe onto the Practice Squad. C.J. Barnett and Thomas Gordon have some talent too. Aside from the 6-game run to finish the 2011 season, and a game here or there, the New York Giants’ defense has been brutally bad the last two seasons. The statistics don’t lie. In 2012, the Giants finished 31st in total defense. The defense allowed 6,134 yards, or 383.4 yards a game, both the highest figures in franchise history. The defense also gave up 6,022 yards in the 2011. These are the only two seasons in which the Giants allowed 6,000 yards in their history. In 2012, the New York Giants allowed 60 passes of 20 or more yards (the NFL’s fourth-highest total), 29 passes of at least 30 yards (led the NFL), and 13 passes of 40 or more yards (second in the league). The Giants have invested a lot of resources in terms of draft picks, free agent acquisitions, and salary cap space in the secondary. But the returns have not been good. The Giants were 29th in pass defense in 2011 and 28th in pass defense in 2012. Now to be fair, good pass defense encompasses all three levels of the defense: pass rush, linebacker coverage, and defensive back coverage. But there is no denying the New York Giants secondary has not performed up to expectations. Over-hyped and inconsistent players, questionable coaching, injuries, or a combination may be to blame, but quarterbacks on other teams have looked forward to throwing against this secondary. Do the Giants have the players to improve their pass coverage? Can the coaching staff put these players in best position to succeed? The defense first needs to stop the run to get opposing offenses into more predictable passing situations. But to be blunt, the secondary has not done a good job of covering people. It’s scary to think just how much worse the pass defense would have been had it not been for New York’s 21 interceptions last season (more than a third of them from bargain-basement surprise safety Stevie Brown). There are currently eight safeties on the Giants’ training camp roster. At most, the Giants will keep five on the 53-man roster. Former 1st-rounder Kenny Phillips signed a relatively cheap deal with the Philadelphia Eagles. While it’s clear the Giants were worried about the long-term health viability of his reconstructed knee, his departure is also a cause for concern. The Giants need to find an adequate replacement. Antrel Rolle: Rolle was originally drafted as a cornerback in the 1st round of the 2005 NFL Draft by the Arizona Cardinals. After three inconsistent seasons at corner, the Cardinals moved him to free safety in 2008, where he excelled. Rolle was signed by the Giants in March 2010 after the Cardinals cut him in a salary-related move. Rolle has never missed a game with the Giants. For the second season in a row, he finished with 96 tackles, two interceptions, and one forced fumble. He also had five pass defenses in 2012 (four in 2011). One of the better coverage safeties in the game, Rolle has good speed and range. Due to his experience as a cornerback, unlike most safeties, Rolle can play man coverage and has often been called upon to play the slot corner position. That said, Rolle hasn’t made a lot of plays on the football with the Giants (a total of five interceptions and 13 pass defenses in three seasons). Somewhat of a mouthy malcontent when he came to New York, Rolle has become one of the leaders of the defense. Rolle’s biggest problem? By far, he’s the highest paid defensive player on the team with $7 million in salary (and a $9.25 million overall cap hit) in both 2013 and 2014. In the latter year, only Eli Manning is currently scheduled to take up more cap space. The Giants are hoping that they can play Rolle more at free safety this year. Injuries to other players have forced him to play both strong safety and nickel back. Perry Fewell is obviously counting on Rolle to be the leaders of the secondary. “He’s got to be the glue that keeps us together,” said Fewell. “At safety I have to be a little more disciplined playing the position being that I’m the last guy in the line of defense so I just transfer my mind to understand my role and understand where my help is going to be and where I need to be the protector and where you can take those little slight chances and gambles,” said Rolle. Stevie Brown: Brown came out of nowhere and had a tremendous season in 2012, intercepting more passes in a single season by a Giant in 44 years. Brown played in all 16 games, started 11, and finished with 76 tackles, 11 pass defenses, eight interceptions, and two forced fumbles. Brown was originally drafted by the Oakland Raiders in the 7th round of the 2010 NFL Draft. The Raiders cut him the following year and he signed with the Colts. The Colts declined to tender him in 2012 and he then signed with the Giants. Brown has excellent size and strength for a safety. He’s got pretty good speed for his size, but he lacks overall quickness and agility that you see in smaller safeties. In 2012, the ball just seemed to find its way into Brown’s hands. Sometimes it was a lucky bounce or bad throw, but to his credit, Brown also made aggressive plays on the football. The million dollar question is was 2012 a fluke? Right now, Brown is penciled in as the starting strong safety. Brown needs to become more consistent and avoid mental breakdowns that lead to big plays by the opposing team. As a big, physical safety, he should also be a bigger factor in run defense than he was in 2012. Ryan Mundy: Mundy was signed by the Giants as an unrestricted free agent from the Pittsburgh Steelers in March 2013. Mundy was originally drafted in the 6th round of the 2008 NFL Draft by the Steelers. After spending his rookie season on Pittsburgh’s Practice Squad, Mundy hasn’t missed a game in the last four seasons, and has started five times. Mundy was an under-the-radar signing by the Giants. The word on him coming out of Pittsburgh is that he a very physical safety who hits hard and plays well on special teams, but who also struggled at times against the pass. Merritt also likes Mundy’s leadership. “If the season at all starts to dip and players start to slack, I’m gonna lean on him,” said Merritt of Mundy. Mundy says being with the Steelers has prepared him well. “I know how to work, I know how to practice, I know how to focus in meetings,” said Mundy. Will Hill: Hill was a top-ranked athlete coming out of high school in New Jersey, but off-the-field issues at the University of Florida caused him to go undrafted and unsigned as a junior entry in 2011. The Giants invited him to the May 2012 rookie mini-camp on a tryout basis and signed him after that camp ended. Hill not only made the 53-man roster last season, but he became an important reserve, despite being suspended for four games by the NFL for using Adderall. Hill played in 12 games and finished 2012 with 38 tackles, two pass defenses, and one forced fumble. Hill has average size for the position, but he is a very good athlete with fine speed and quickness. He is a physical player and tackles well. He also is a very good special teams player. Physically, Hill looks and plays like an NFL starter. The questions with him are mental. Can he stay focused on football? Can he keep his nose clean? That is looking more unlikely as it was announced on July 20 that Hill has been suspended by the NFL for four regular-season games again, this time for apparently using illegal drugs. Hill’s future with the Giants and the NFL is now very much in doubt. Cooper Taylor: Taylor was selected in the 5th round of the 2013 NFL Draft by the Giants. Taylor is a huge safety with very good timed-speed, agility, and overall athleticism for his size. Tyler Sash: Sash saw his playing time significantly decrease in 2012. First, he was suspended for four games by the NFL for using Adderall. In early December, he suffered a hamstring and despite being able to return to practice, Sash did not play in the last four games of the season. Sash played in just seven games and finished with only eight tackles. Sash was drafted in the 6th round of the 2011 NFL Draft by the Giants. As a rookie, he played in every game and finished the regular season with 17 tackles and one forced fumble on defense. He also was one of team’s better special teams players. Sash is more of a strong safety-type who plays better closer to the line. He has good size, but lacks ideal speed and agility. David Caldwell: The Giants signed Caldwell to a Reserve/Future deal in January 2013. Caldwell was originally signed by the Indianapolis Colts as an undrafted rookie free agent after the 2010 NFL Draft. He spent his rookie season on Injured Reserve. In 2011, he played in 16 games with 13 starts and accrued 67 tackles and four pass defenses. The Colts waived him in August 2012. Caldwell lacks ideal height but he is well-built and a good athlete. He’s a smart player and a reliable tackler. Caldwell did not make many plays on the football when starting for the Colts. Alonzo Tweedy: Tweedy was signed by the Giants as a rookie free agent after the 2013 NFL Draft. Tweedy was a part-time starter in a linebacker/safety role at Virginia Tech. He has a nice size/speed combination, but was primarily known more for his excellent special teams play in college. Summary: Until Will Hill’s suspension, the early favorites to make the 53-man roster were Rolle, Brown, Mundy, Hill, and Taylor. Rolle will obviously start at one safety spot, but one wonders if he will become a cap casualty in 2014. It’s hard to see Brown duplicating his turnover production again, but it may be more important for him to simply become a more consistent, reliable player on a down-to-down basis against the pass and the run. Mundy seemed like a ho-hum signing in March, but Merritt has been raving about him. Still, Steelers fans were underwhelmed. Hill and Taylor both have excellent physical tools. Taylor is extremely smart, but Hill’s second drug suspension raises serious questions about his future with the team. Hill’s troubles may have opened the door for Sash, Caldwell, or Tweedy, three players who are going to have to fight and scratch to make the team.